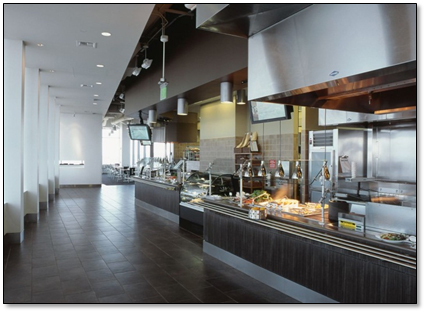 The café is located on the 28th Floor and is sized at approximately 8380 s.f. with 3130 s.f. of servery/ kitchen and storage space, for which the Consultant had primary design responsibility. It serves 274 seats. Scope also included the Espresso/Deli of around 200 s.f. on Floor 15 as well as the two meeting room pantries at 200 and 140 s.f. respectively.